situated on a quiet cul-de-sac with no rear neighbours resides the largest available 1300 sq ft., 3 bedroom freehold, end unit town home in popular waterloo village which provides ease of access to all amenities. pride of ownership resonates the moment you enter this lovely home. main level offers tile throughout the entry, powder room and kitchen, fresh neutral colours, updated oak kitchen and hardwood in the living and dining area. 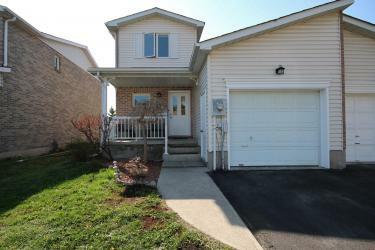 proceeding upstairs, plush carpet, large full bathroom, large master bdrm and 2 good sized additional bedrooms. lower level offers a gas fireplace for those cold winter nights, an additional den/office space and pristine/large laundry area. updates include brand new fixtures throughout, freshly painted, a/c 10, furnace 04 and shingles 09.